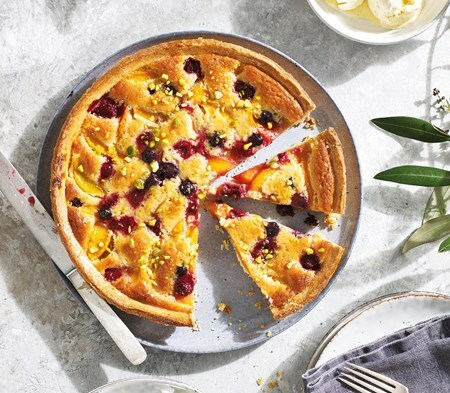 Peaches, raspberries and blueberries on orange frangipane in a shortcrust pastry case, sprinkled with chopped pistachios. Remove all packaging when frozen: Always take your pud out of its box and put it on your serving plate while it’s still frozen. Serve at the correct temperature. Some puds are best served at room temperature, but cheesecakes are best chilled. Always check the instructions on the packaging. Slice with a hot knife. Dip your knife in hot water to get a lovely, smooth slice. 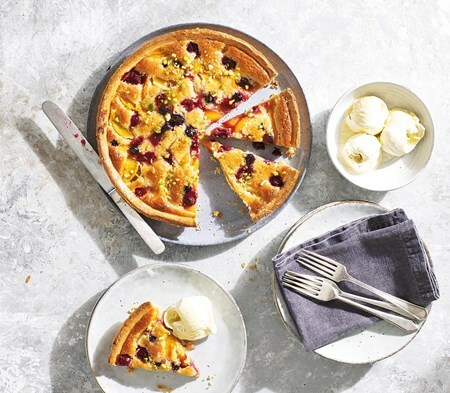 Our classic pastry base is baked blind and filled with an orange flavoured almond frangipane. We then arrange peach slices, raspberries and blueberries over the frangipane. Once baked and cooled, we add an apricot jam glaze and sprinkle over some chopped pistachios. Please Note: The details above are correct as of 23 March 2018 but as we are constantly improving our recipes it is essential to check the label on the packaging. Peaches (18%), Bread Flour (18%) (contains: Bread Wheat, Calcium Carbonate, Mastermix, Ascorbic Acid), Butter [Milk] (contains: Butter [Milk], Salt), Caster Sugar, Margarine (contains: Vegetable Oil (Palm Oil, Rapeseed Oil), Water, Salt, Emulsifier: Mono- and Diglycerides of Fatty Acids, Natural Colourings: Annatto, Curcumin, Natural Flavouring), Raspberries (7%), Ground Almonds (6%) [Nuts], Free Range Pasteurised Egg, Self Raising Flour (contains: Wheat Flour (contains Calcium, Iron, Niacin, Thiamin), Raising Agents: Acid Calcium Phosphate, Sodium Bicarbonate), Blueberries (2%), Soft Light Brown Sugar (contains: Sugar, Cane Molasses), Apricot Jam (contains: Glucose Syrup, Sugar Syrup, Concentrated Apricot Puree, Water, Acidity Regulator: Citric Acid, Gelling Agent : Pectin, Natural Flavouring, Preservative: Potassium Sorbate), Free Range Pasteurised Egg Yolk (contains: Acidity Regulator: Citric Acid, Preservative: Potassium Sorbate), Orange Juice, Peach Concentrate, Semolina [Wheat Gluten], Pistachio [Nuts], Orange Oil (contains: Sunflower Oil, Orange Peel), Orange Zest, Water.